Emily Residence - an exclusive world of tranquil living in the heart of town. Where the lush serenity of nature beckons at your doorstep, juxtaposed calmly against the excitement of city living. Where you can wine, dine, and party till late, and yet be back in the comforts of home in a matter of minutes. Emily Residence, a stylish freehold residential development rising next to Mount Emily Park. With just 38 apartments available, five will feature their own private gardens in the sky. 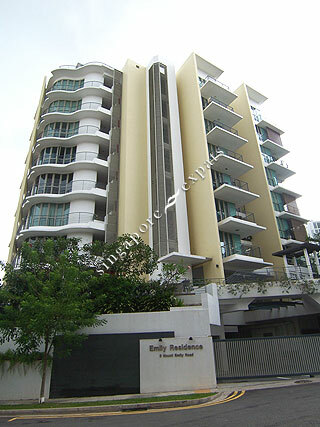 Emily Residence is situated in the prestigious district 9 that's also rich in heritage and marked for arts, cultural and educational institutions such as National Academy of Fine Arts (NAFA), LaSalle-SIA College of the Arts, Singapore Management University (SMU) and the National Library. As Emily Residence is just a stone throw away from the Plaza Singapura, Park Mall, Paradise Centre, amenities such as supermarkets, food centres and shop are within a short walk away.